This month's quiz- What's unusual about this saguaro cactus? Scroll down for the answer! 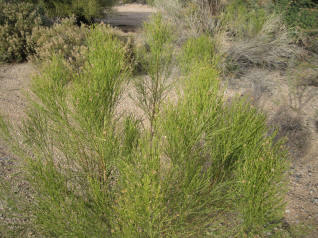 I often am amused when I see homeowners, new to the desert, watering desert broom in their yard. "It's such a pretty green plant," someone once told me. But as the opportunistic and insidious plants get larger, the difficulty factor in ripping them up, climbs higher on the misery scale. 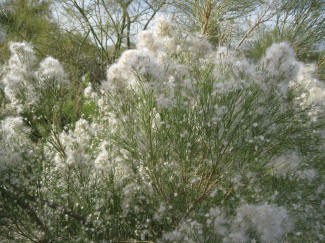 In the photo below, you see how desert broom looks most of the year, then we've put a photo of the enormous clumps of seeds they disperse in December. I recently got an email from the Entrada Homeowners Association reminding homeowners to get the broom out before the center tap root approached China. "They are easiest to pull it out of the ground when they are a youngster," the email advises. If you're too late, they recommended Round Up be used to try and knock it off. Around our home, we launched an offensive against desert broom and removed all of it from our yard years ago, and for each plant, it took 3 or 4 days of watering around the base, then using a 4-wheel-drive Chevy Suburban with a chain to rip it out, sometimes breaking the chain. Followed by packing salt where the root was, to prevent it from coming back up. If even a portion of the root is left, it can come back again. Why is this plant so reviled? Some background: In December, millions of cotton-like spores, reminiscent of dandelion seeds, blow everywhere and get into everything. Years ago, my airplane mechanic had to take off the plane's fuel injection system and send it in for a thorough cleaning, after we suspected some desert broom seeds have penetrated inside and causing the engine to run erratically! (serious problem). The amazing thing is that desert broom doesn't take root and grow wild, but only can get started in disturbed earth, around home and road construction sites. Carefree (PW)-A well-known celebrity recently came out with an entourage and bodyguards to look over one of our high-end listings. This person was seeking a refuge from the paparazzi and our mountaintop home was the perfect escape. Although it was listed at $8.3 million dollars, the agent for the buyer gave us an offer of $3.5 million! The explanation went like this. . . .This celebrity had paid $12 million dollars for his home on the West Coast, but was forced to sell it for around $7 million. "If I'm going to feel that kind of pain," he explained to me, "the person I buy from is going to feel the pain as well." This seems to be the prevalent method of home-shopping these days. For something to sell, the buyer has to extract some pain, after all, they gave up a lot of money when they sold, and they expect to be rewarded with the buy of a lifetime. I prefer to look at in in less of a bloodsport analogy. I tell our sellers they won't be able to get top dollar when their home is sold, however they will get it all back, and then some, when purchasing a home of far-greater value. No Pain, No Gain! Economic recovery nowhere to be seen! The productivity of U.S. workers rebounded even more in the third quarter than previously estimated, showing companies were focused on controlling costs. The measure of employee output per hour rose at a 2.3 percent annual rate, compared with the 1.9 percent initially calculated and a 1.8 percent drop in the previous three months, revised figures from the Labor Department showed today in Washington. Labor expenses fell. Gains in payrolls and the workweek so far this quarter indicate companies are coming up against limits on how much more efficiency they can wring from current staff to meet rising sales. General Motors Co. is among businesses planning to boost employment in a bid to take advantage of a growing market. "Everybody is trying to make do with what they've got," Ken Mayland, president of ClearView Economics LLC in Pepper Pike, Ohio, said before the report. "Demand is growing faster than you're able to squeeze out of the labor force, so some increase in headcount is going to be needed." Economists projected productivity would increase 2.3 percent, according to the median of 66 forecasts in a Bloomberg News survey. Estimates ranged from increases of 1.9 percent to 2.8 percent. Labor costs, adjusted for efficiency gains, fell at a 0.1 percent pace, the same as previously estimated. They were projected to fall 0.2 percent, according to the Bloomberg survey median. Expenses in the second quarter jumped 4.9, the most in almost two years, reflecting the Commerce Department's revised data on gross domestic product and personal income issued last week. The economy expanded at a 2.5 percent annual rate in July through September, more than the 2 percent initially calculated, the Commerce Department reported on Nov. 23. Corporate profits rose 2.8 percent from the previous three months and have been up every quarter since the first three months of 2009, the GDP report showed. Wages and salaries jumped by $97.4 billion at an annual pace in the second quarter and $51.4 billion from July through September. Hours worked climbed 1.7 percent from a year earlier, the biggest gain since 2006, today's report showed. 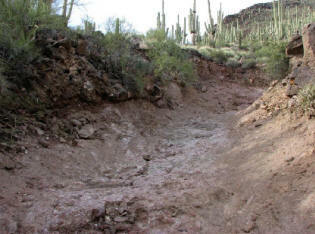 Flash floods can occur any time of the year in the desert, and it takes about two feet to float a car, much less to wash it downstream! 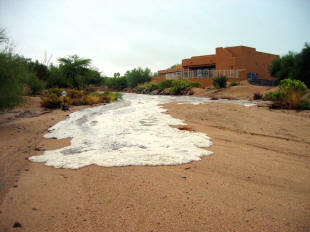 Water can quickly rise to unbelievable heights once the foamy tongue of water comes by. TV helicopters kept an ongoing vigil above this Cave Creek house to capture it's fall into raging Cave Creek. It never went in, despite 80 feet of shoreline washing away. One of the main landmarks of the area, Elephant Butte, also experienced some weather-related changes from the same January storm. A landslide swept down the Elephant's Ear portion, damaging one of the trails in the Spur Cross National Recreation area. Below you'll see a full photo of Elephant Butte, and then a close-up photo of the landslide area, courtesy of the Nature Conservancy and interpretive ranger Kevin Smith, who described the slide as "a relatively major geologic event." 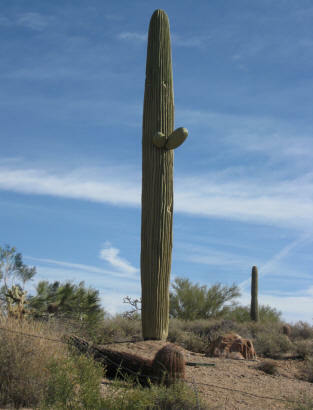 Answer to this month's quiz- What's unusual about this saguaro cactus? It's not a cactus! This is the latest generation of cell phone towers to go up near Pima Road and Carefree Drive. While the first versions of these were easy to spot, with their huge size, they are now getting smaller. 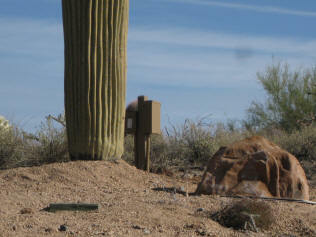 Note on our top photo, the simulated cactus wren holes and the small saguaro arms. Look closely at the base, however, and you'll see the electrical connections. The rock is fake as well. 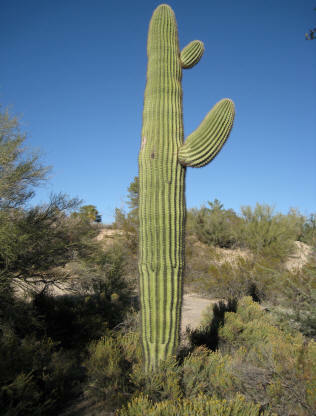 Oh, just to compare, below is a REAL saguaro! The first arms are said to come out on the average, after forty years!